The bags are packed. The bags are on the bike. One of the bags is hanging off a bit, which is not so good. 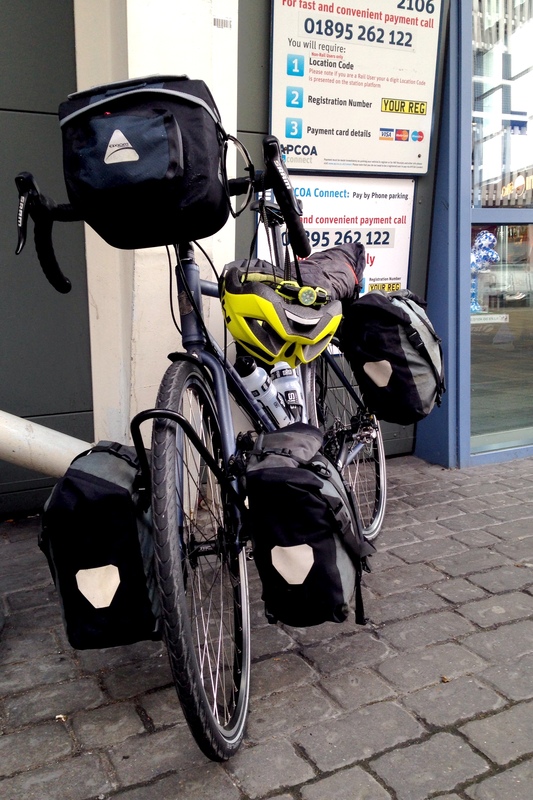 And the bags, the bike and me are in (currently) sunny Cornwall, ready to begin touring again. That’s a good day (even after getting drenched on the four miles to the station this morning). So, where am I going? Well, I’m riding (as close as sensibly possible) the length of the United Kingdom from south to north. And I’m going to all four of the UK’s countries on the way. This sounds deceptively simple, but even among my fellow British Citizens, there may be a little confusion about exactly what it means. There are a lot of misconceptions and misunderstandings about where the UK starts and stops. Many people I met in the US, for example, think that England and Britain are the same thing, and labour (or ‘labor’) under the odd impression that there’s such a thing as a ‘British accent’. They aren’t, and there are hundreds, including a bunch of Scottish, Northern Irish and Welsh ones. So, first off, a little geographical ‘clarification’ for you. This may need reading carefully if you’re not over-familiar with our little archipelago. The archipelago known as the British Isles lies off the coast of mainland Europe. It’s made up of hundreds of islands, and is shared between two nation-states, the UK and the Republic of Ireland. The two biggest islands are Great Britain and Ireland. 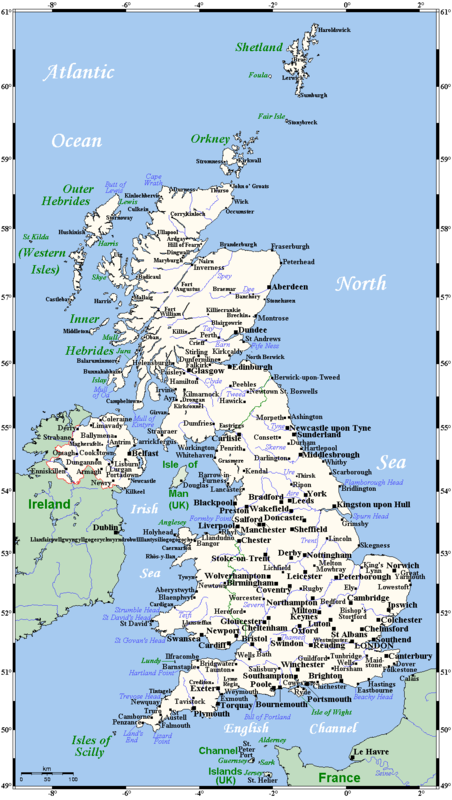 All of Great Britain (comprising most of England, Scotland and Wales), a bunch of other islands, and the north-eastern chunk of Ireland (Northern Ireland) are in the UK. The rest of Ireland (and some other islands) is a separate nation-state, but was part of the UK until independence in the 1920s. So, Ireland is an island. And most of Ireland is not in the UK, but some is. And all of it used to be. Clear as mud, isn’t it? Let’s simplify things by looking at sport. In the Olympics, the UK competes, slightly confusingly, as ‘Great Britain and Northern Ireland’. In football, England, Scotland, Wales and Northern Ireland play as separate countries, and so does the Republic of Ireland. Obviously, as it is. Except in Rugby, Ireland and Northern Ireland play in a united Irish team, meaning that the one team represents two nation-states. But one island. That might still not be clear enough for some people. So here’s one more try. The UK is a proper country. It’s on the UN Security Council and everything. It issues its own passports and money (the pound). It’s governed from London, which is in England and in the UK (technically, it’s governed from Westminster, which is next door to London, but that’s an entirely different set of ancient confusions). It has military forces, a single foreign policy, and a single Prime Minister who deals with that sort of stuff. So, it’s a country. But… England, Scotland, Wales and Northern Ireland are also called countries. Together, these four countries make up the UK, which is a country. Banks in Scotland and Northern Ireland (but not in Wales) can issue their own banknotes. They are authorised to do this by the Bank of England, which manages the currency and sets interest rates for the whole of the UK. Scotland and Northern Ireland (but not Wales) have their own legal systems. England and Wales share the same one. Scotland has its own parliament, Wales and Northern Ireland have their own assemblies. England has neither, just relying on the UK Parliament in Westminster. Which obviously has elected members from Scotland, Northern Ireland and Wales in it. And all four countries have their own capital cities; England’s just happens to be the capital of both England and the UK. And everyone who has a UK-issued passport is British. Including lots of people from places which aren’t part of the UK. Or Great Britain, which, as we established at the start, is an island, like Ireland. Well, finally (I promise! ), there’s one place from where, on a clear day, you can apparently see all four of the UK’s constituent countries. It’s right in the middle of the UK. This place is another of the British Isles; the Isle of Man. The sportspeople of the Isle of Man (for example, the great cycling sprinter Mark Cavendish) compete for Great Britain and Northern Ireland. Unless it’s the Commonwealth Games, of course, when they compete as the Isle of Man. The island uses the pound, and is protected by the UK military. And obviously, the Isle of Man isn’t part of the UK at all. It strikes me that it might be easier just to say where I’m going. After a lot (and I mean a lot) of internet-bashing, I finally worked out that the southernmost point of the UK is in the Isles of Scilly, three hours south-west by ferry from Penzance in Cornwall, where I now sit. And the northernmost point is in the Shetlands, which are a surprisingly long way north. You get palm trees down here in Cornwall. The north of Shetland is roughly level with Anchorage, Alaska, and the bottom end of Greenland. It’s about 200 miles from Bergen, in Norway, and over 600 miles from London. Thankfully, they’re both marked on the map (thanks, Wikipedia!) up above the confusing stuff. I’m setting sail for the Isles of Scilly tomorrow morning (Friday), and then heading over to Land’s End, which is back on the mainland. Then it’s back up to Bristol for my first day off (I’ll hopefully update the ‘Progress’ page on the website with some more realistic stats and maps while I’m there). Then it’s up through the Welsh borders and Liverpool to Lancashire, then another ferry to the Isle of Man (I know, I know, it’s not in the UK). From there to Northern Ireland, then across to Scotland, and all the way up to the top of Great Britain. Then Orkney, then Shetland. 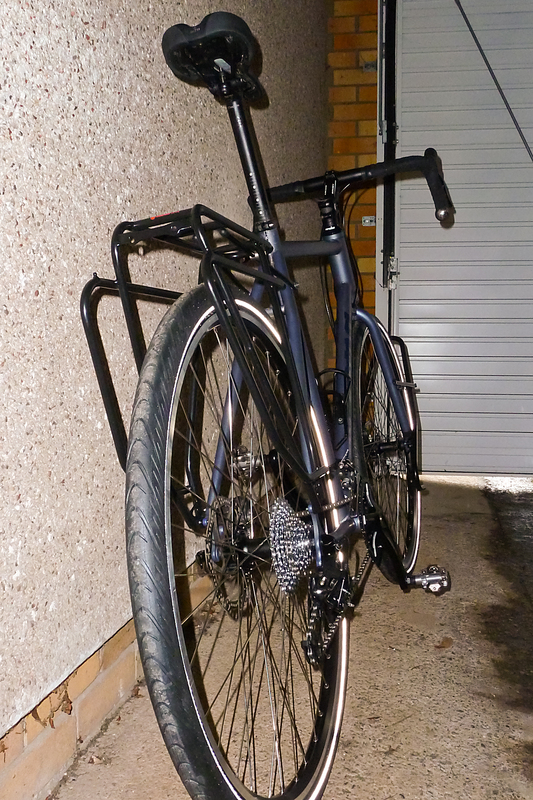 The Beastlet has recovered well from its conversion to a touring bike. New wheels, a mountain-bike chainset, and the mandatory racks have made it considerably heavier, but it feels pretty rugged, and rides really nicely with the bags on. All should be well. And Cornwall, which I’ve unforgivably never visited before, looks lovely (if very hilly). 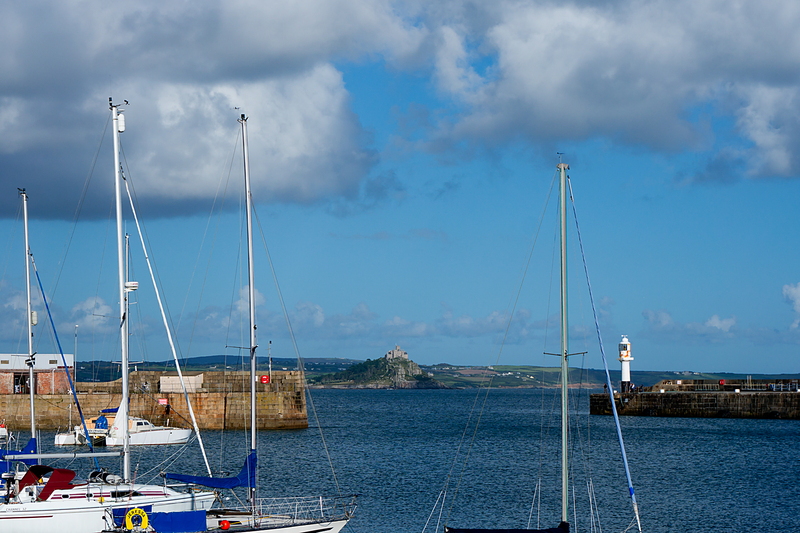 This picture is looking out from Penzance; the castle on the hill in the distance is St Michael’s Mount, which is more-or-less an island. So, a day-trip with minimal cycling tomorrow to get things kicked off. Then the business of touring begins in earnest on Saturday. I’ve been following your journey to recovery. Great determination and attitude! Good luck with the trip. I hope you have lots of fun and enjoyment. Thanks! Bit more luck avoiding trucks this time, I hope! Now I have a better grasp of my lack of knowledge about the country (or are they countries? 😉 ) where the queen of my country lives. Haha. Have a great ride. Nice meeting you Tim on the Tamar bridge. After reading some of your blog entries I think you should consider a journal or book of your travels to date as you have an interesting and real writing style. Would be great to share your adventures in a book. But that’s not for now as you have a busy month ahead of you with s few countries to visit. I am sure with your obvious determination you will succeed in this new venture. So best of luck to you. Hey, Paul! Nice to meet you too. Always good to have a nice chat about tyres and gear ratios 😉 We’ll see re anything more ambitious; will just keep the blog going for now… Ride safe.